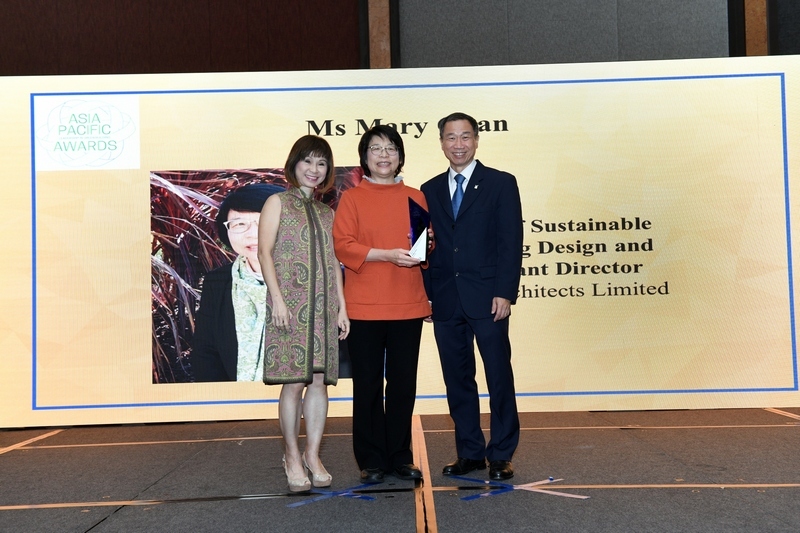 (10 September 2018, Hong Kong) The Women In Green Building Leadership Award, a new category at the World Green Building Council’s (WorldGBC) Asia Pacific Leadership in Green Building Awards, honours its first winner: Ms Mary Chan, Head of Sustainable Building Design and Assistant Director at DLN Architects Limited, Hong Kong. Spearheaded by the WorldGBC’s official partner, AkzoNobel, the leader in paints and coatings, the Award recognises Ms Chan’s integral role in the early development of green buildings in Hong Kong, and her involvement in industry initiatives like the Green Shop Alliance, which comprises of 23 developers and 132 shopping malls to date. This was announced during a ceremony attended by 650 professionals and key government stakeholders, including the Singapore Ministry of National Development, Ministry of the Environment and Water Resources, Building and Construction Authority. The biennial Asia Pacific Leadership in Green Building Awards celebrates the region’s most iconic green buildings, up-and-coming innovators and inspiring companies. This year, the awards was extended to recognise inspiring female leaders in the green building movement, who are driving change for a better future. Nominations were judged by a prestigious panel of industry experts including Mr Curt Garrigan, Chief, Sustainable Urban Development Section, Environment and Development Division, UNESCAP, Ms Milag San Jose- Ballesteros, Regional Director for Southeast Asia and Oceania C40 Cities, and Mr Luca de Giovanetti, Science-based Targets, World Business Council for Sustainable Development. Among her achievements, Ms Chan was instrumental in the early development of green buildings in Hong Kong, spearheading public education and engagement for the next generation. She also initiated the Green Shop Alliance, a key program by the Hong Kong Green Building Council that seeks to promote greener practices amongst shopping mall operators and tenants. The success of the initiative ultimately resulted in the adoption of the Alliance by the Hong Kong government to promote environmental policies. The other two nominees of the Women in Green Building Leadership award were Ms Shakuntala Ghosh, Architect and Partner of Ghosh Bose and Associates in India, and Ms Maria Cristina Samson, Co-President of The Net Group in the Philippines.